The problem with the starter motor really bothered me. 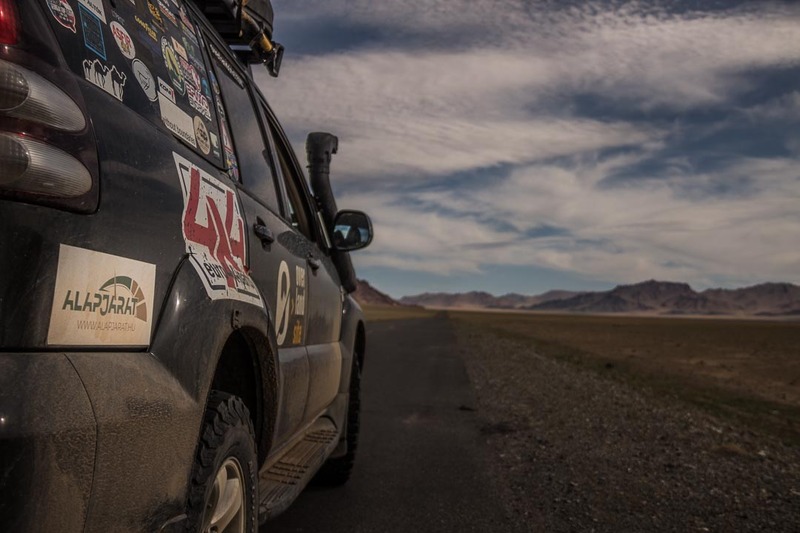 It became increasingly hard to start the engine, with the starter just making a clicking noise but not turning the engine over.I was especially nervous because we had about 1,000 miles ahead of us through some of the most difficult terrains of Mongolia. 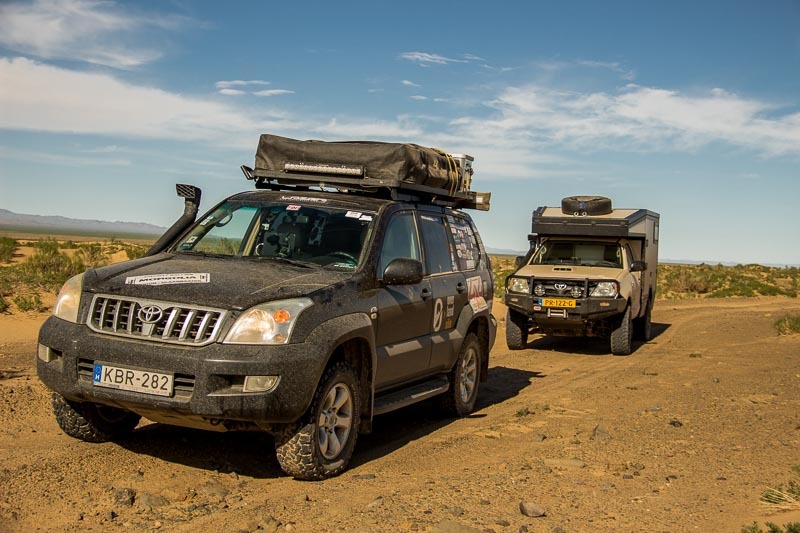 However, we were both looking forward to overlanding with the full group, as Niels and Lotte were on their way to meet us at the sand dunes. Evelin and I climbed the dunes in the morning which really reminded us of our trekking on the dunes in Erg Chigaga, Morocco. 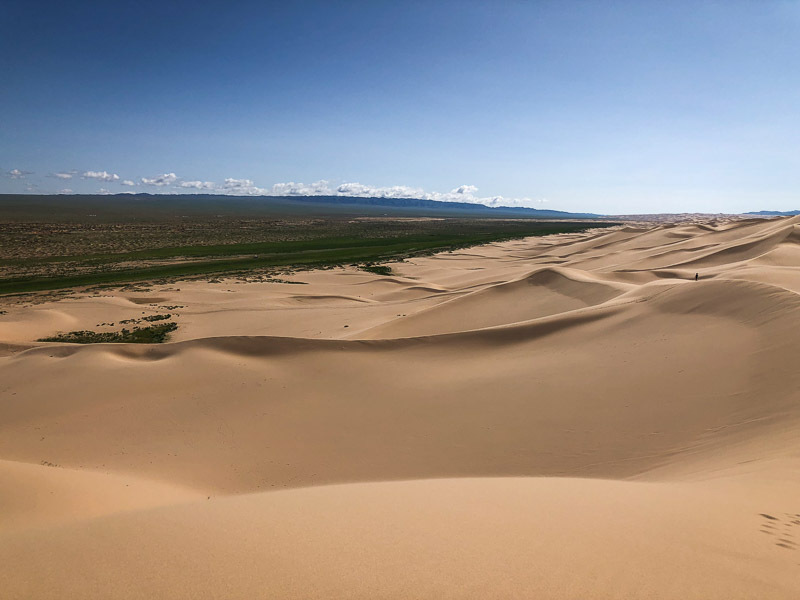 It looks a bit weird how rocky mountains turn into a kind of steppe, then suddenly these enormous sand dunes tower over the next section of quite green, grassy land. The contrast is very conspicuous. When we walked down to the car from the top of the dunes, it was especially difficult to start the engine. I wished we were closer to China, where I imagined it wouldn’t be difficult to find a competent mechanic who could sort out the issue in half an hour. 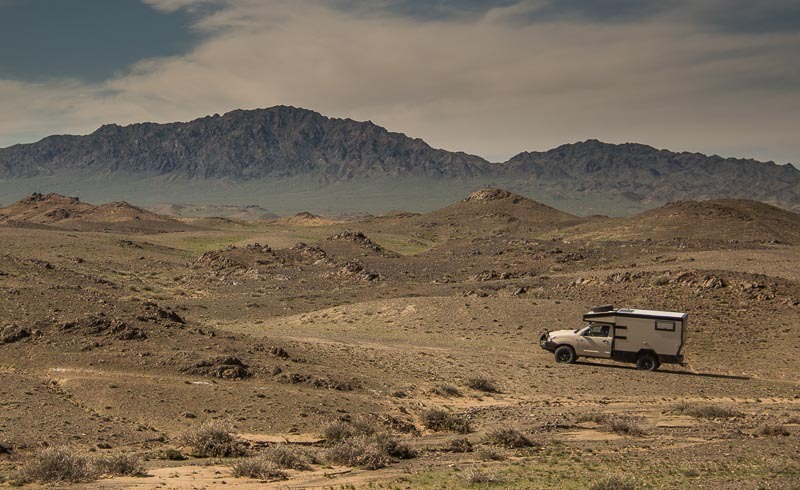 At around one o’clock, the Dutch overlanders’ very nicely converted Hilux camper appeared on the horizon. It was a great moment when we all met. We’d all met each other separately before in Kazakhstan and Mongolia, but the five of us together met for the first time at this moment. 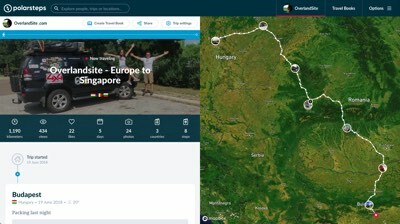 When we set off to drive west (in the direction of our border crossing about 9 days later) I felt a bit safer even with our car issue, as with two other cars you have a lot of options to solve many problems. You can help each other out in difficult situations, just as we did during our African adventure. Our progress was slow but through some amazing landscapes. 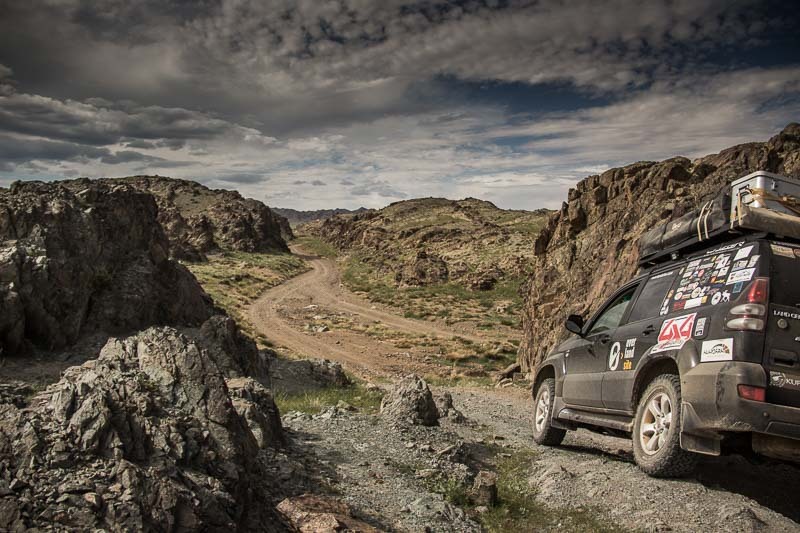 Canyons, gorges, fast grassy sections, and slow and difficult riverbeds made the drive very exciting. I’m not even going to try to describe some of the scenery. I just hope there are some pictures that are good enough to give you an impression. As with the driving, camping at night with all three rigs together was a lot of fun. We cooked a great meal and shared travel stories until late at night. I love camping on our own but prefer doing so with some company. The more the merrier! As I expected, the next morning the engine didn’t want to start. It took quite some time, moving the vehicle a bit and knocking the starter motor with a wrapped hammer for it to eventually start. I was sure that it just got some dirt inside and perhaps needed some greasing. In the next town, Gurvantes, I went into a car wash and tried to powerwash the starter motor from every direction. I knew it wasn’t going to help, but I felt I had to try anyway. But of course, it didn’t help at all. It took another hour or so, quite long after Gurvantes, for both Evelin and I to come to the conclusion that we needed to find a mechanic as soon as possible. 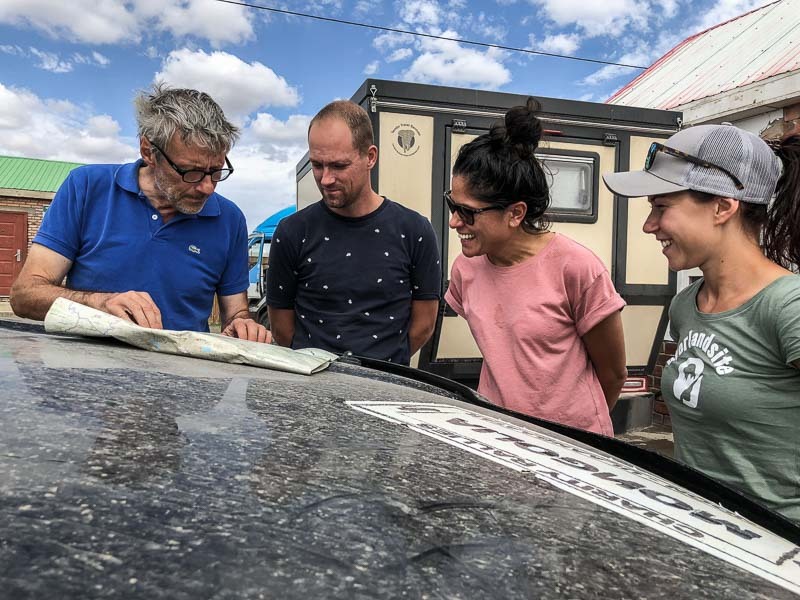 The reason why we continued until this point was that Giampiero offered to pull us if we were completely unable to start our engine, and I was sure Lotte and Niels would also help. 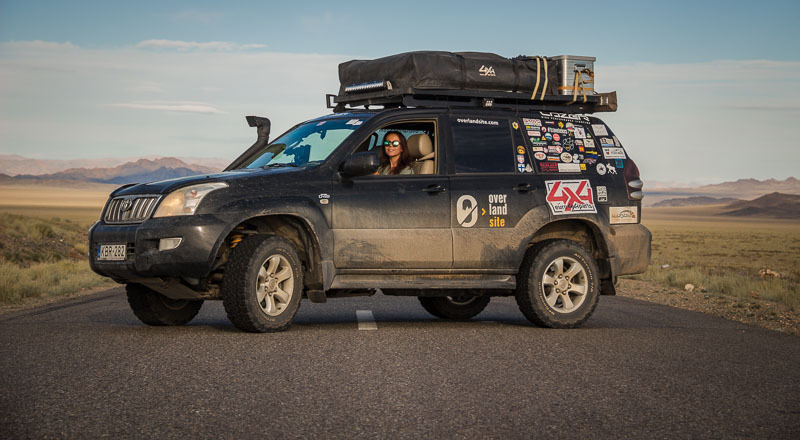 But with at least 900 miles left to go, 100% of this being off-road, I felt very uncomfortable with the risk of getting stranded somewhere and affecting the trip for two other overlanders too. 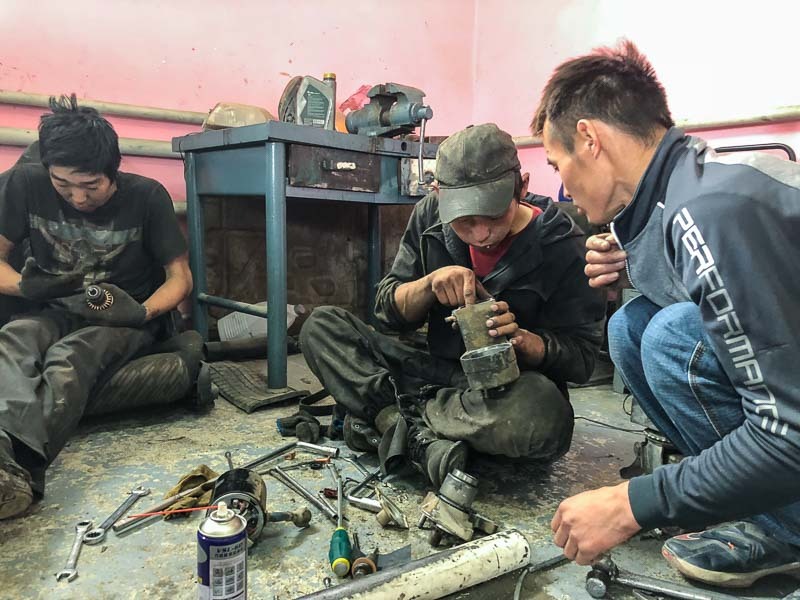 We stopped and explained to the other guys that we’d decided to break off from the team and drive up north to Bayankonghor to find a mechanic who’d be competent enough to fix a starter motor. 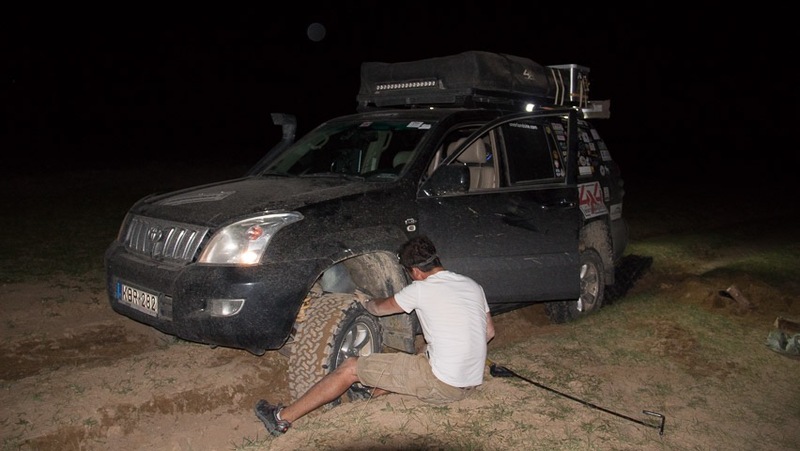 Judging from what we’d seen in Dalanzagdad, we didn’t stand a chance of finding a mechanic any closer.Bayankonghor was about 300 miles away. 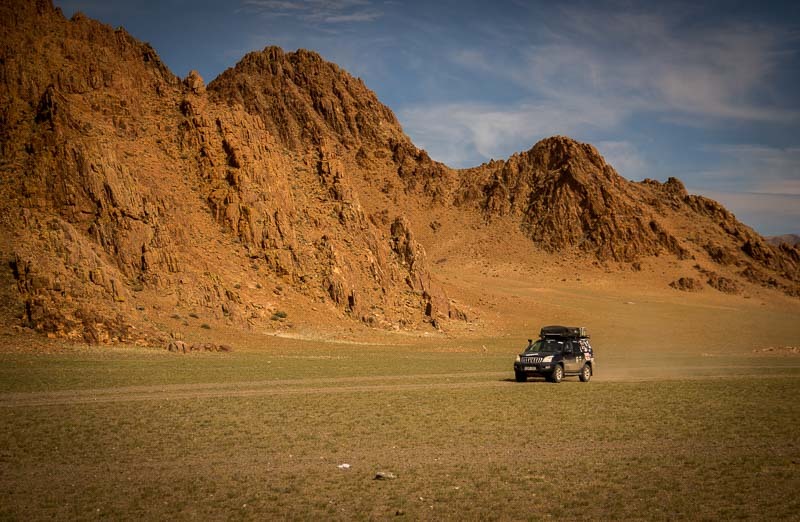 Usually this would‘ve been an easy 5-6 hours drive, but this was Mongolia and we were in the Gobi. 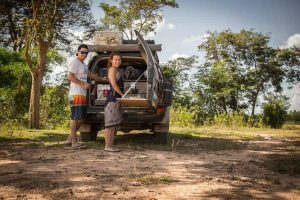 We knew it was going to be tough and since I wouldn’t want to stop the engine while we were alone, we’d have to drive non-stop until we got to the mechanic. 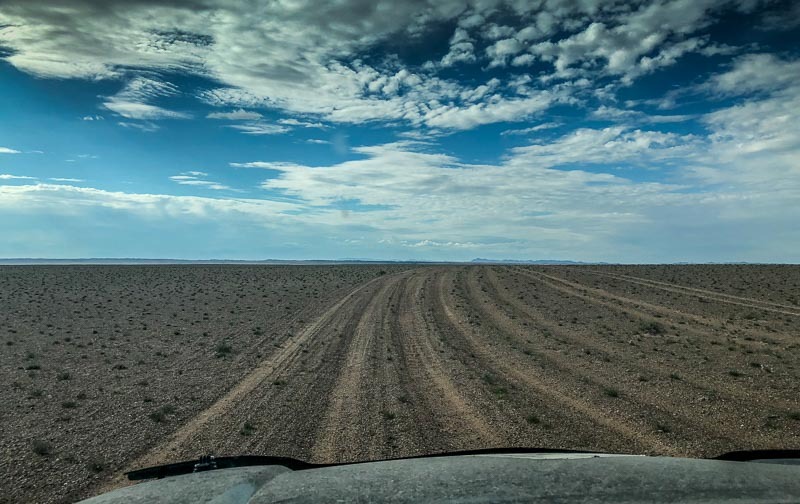 So the other guys continued west, while we headed north on some completely deserted roads where we wouldn’t see another vehicle or person for hours. In the best case scenario, we expected to arrive in Bayankhongor around midnight. We didn’t know what we had ahead of us, but it was a task that had to be done. I was looking forward to not worrying about such a basic thing as whether or not the engine would start. The washboard gravel roads were extremely annoying, but luckily none of the river crossings or muddy areas slowed us down. Looking at the map though, I was worried about two or three sections of the planned route. 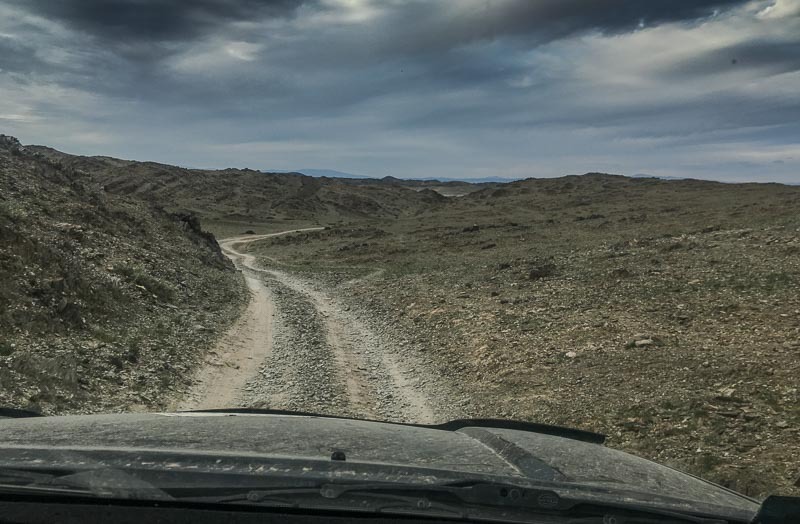 There were two mountain ranges that we had to cross and Lake Bogd was right next to the road, so mud could be an issue. By the time it started to get dark it became obvious that we wouldn’t be making it to Bayankonghor by midnight. Even though we could sometimes reach 40mph on wide grassy areas, most of the time our speed was below 25 mph. 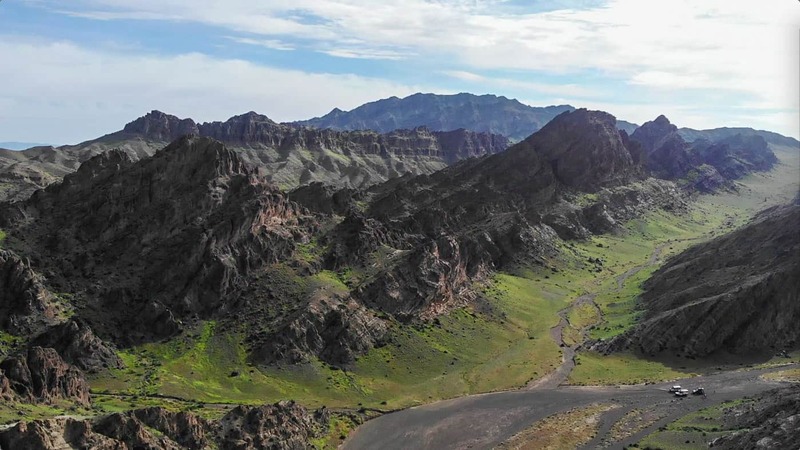 The first mountain range proved to be even slower. For about an hour and a half the trail was so difficult that we had to drive in low range, 1st gear. At that point it wasn’t our speed that worried me but the sharp rocks that the basically made up the trail. The gorge was frightening. 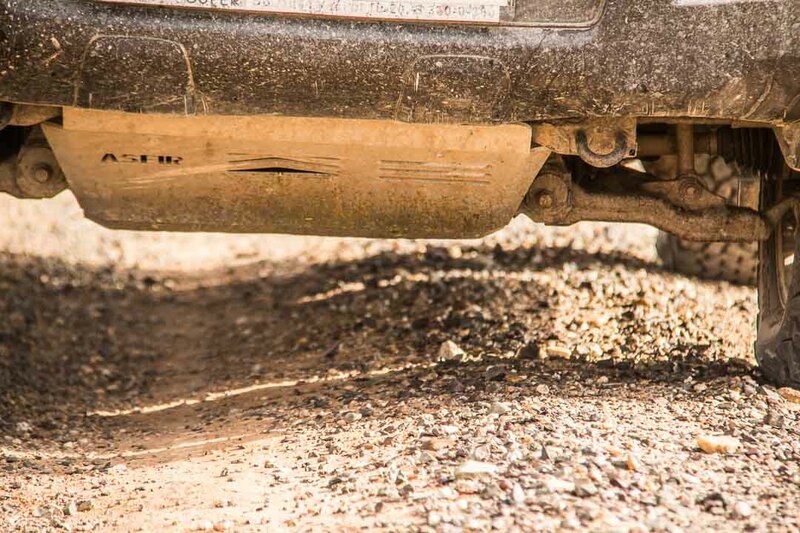 The bottom of the truck was constantly scraped by pointy rocks, while one of them was not just a rock on the surface but a massive boulder with a pointy end, so when the Asfir bash plate hit it, the truck actually got stopped by it. With only one spare tire, I thought it was just a matter of time until we got a flat tire, which in that case would’ve caused huge issues. Not only did we have just one spare tire in a place where there were millions of sharp rocks around, but in the event of getting a flat tire, I wouldn‘t have been able to lift the truck in this place with our pathetic hydraulic jack. Luckily, our BF Goodrich K02s held up (it’s a fantastic tire!) and after an agonizing 90 minutes we were through the mountains. I was quite tired by 2.00am when we got into trouble again. But this time it was for real. The tire tracks on the road I was driving on simply got too deep on both sides (or the middle of the track got too high, depending on how you look at it), and suddenly the rig just beached. There was nothing I could do. I saw it coming at the last moment and tried steering left to get some traction and climb out of the deep tracks, but it was way too late. The car’s belly was sitting on this pile of soil and it was evident again that our ground clearance wasn’t sufficient. I should’ve gone for bigger tires and a higher lift kit. We only have a 2-inch lift and original, 265/65/17 tire sizes. Good for fuel consumption, bad in situations like this!It took me 4 hours (yes, 4) to dig most of the soil out from under the car. I tried to keep my spirits up but by 6.00am I was a bit tired. Evelin couldn’t help as we only had one shovel. I just felt sorry for her, as she was tired too and my mistake meant she couldn’t sleep somewhere in a hotel by this time, but she had to wait until I freed the Toyota again. This happened very close to Lake Bogd (where we got bogged!) so the mountain range and the lake that I was afraid of both proved to be very difficult sections. It was 9.00am when we reached Bayankonghor. 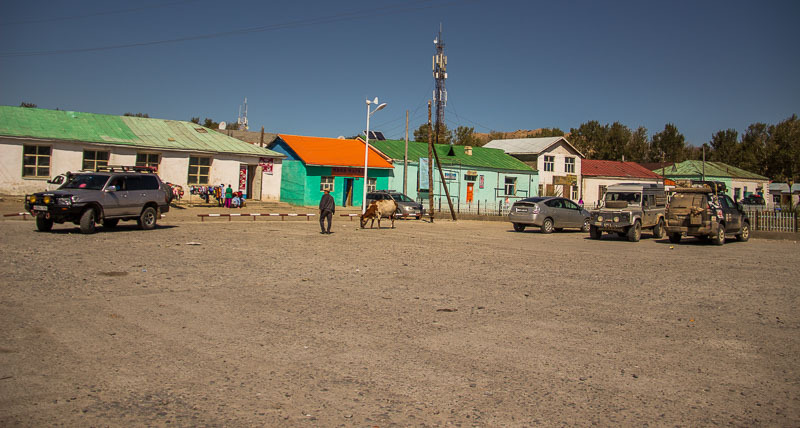 The town is supposed to be a larger town in Mongolia on the Southern Route, which is one of the major roads going from the Russian border to Ulaanbaatar. However, the town is still messy and chaotic, and most roads leading to the town are still only dirt tracks. We checked into a hotel we’d stayed in before and I went to find a mechanic. Unfortunately, Chinzo couldn’t recommend a local workshop so I just drove around to find one. I stopped at the first one that looked okay. I explained the problem and wanted to ask if they could help, but by that time one of the guys was already under the car taking the starter motor off. Four guys worked on it quite thoroughly as far as I could tell. They were done in no time! 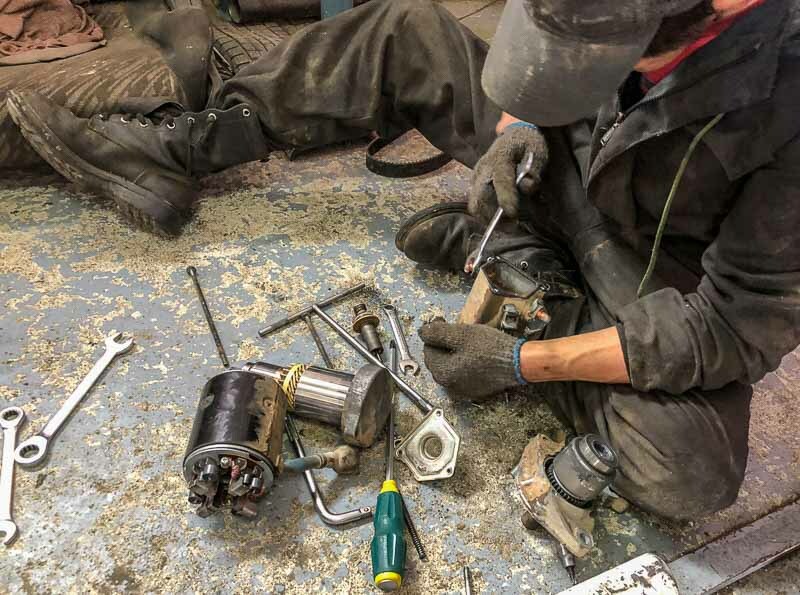 They cleaned the motor inside, greased all the parts and brushed the electric connections, and ever since then the engine has been starting without a single issue. 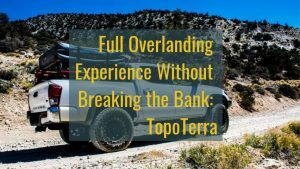 I was quite relieved that the problem was actually the one I assumed, and was looking forward to some trouble-free overlanding to the Chinese border. We still had at least 600 miles to go until the border where we’d meet up with the gang again. 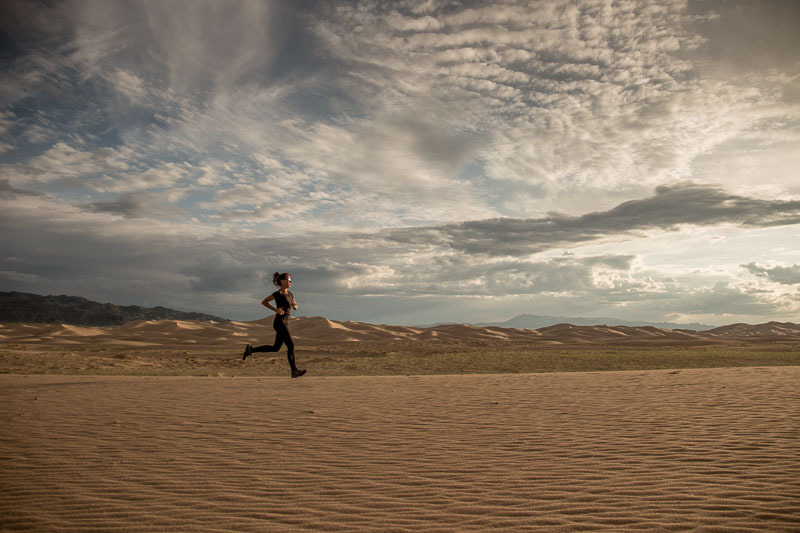 This distance can take several days in Mongolia so we didn’t have too much time to spare. 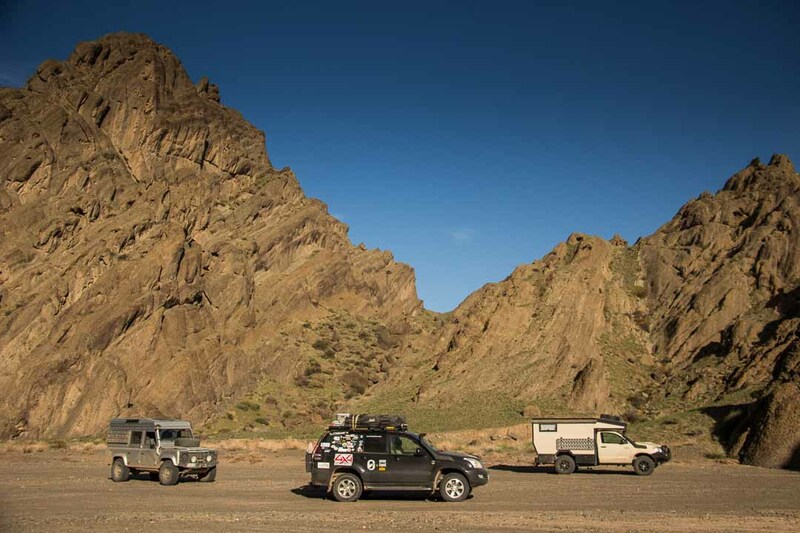 We set off the next morning on the Southern Route driving east.It was a tough drive again. The river halfway to Altai was impassable. 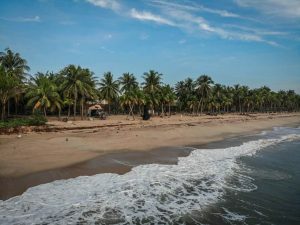 Water levels had risen all over the country during the previous weeks and months. Mud and too much water blocked the traffic on a road which was supposed to be one of the major transport corridors between east and the capital city. A couple of tractors were parked nearby with their drivers hoping to earn some money by pulling vehicles across the muddy river. We didn’t want yet another problem due to water and mud, so decided to find a track going north where we knew there was a bridge. It was a big detour, but it was the better option compared to being pulled across by a tractor. Eventually we made it to the other road with the bridge and continued eastward, but it was getting dark. 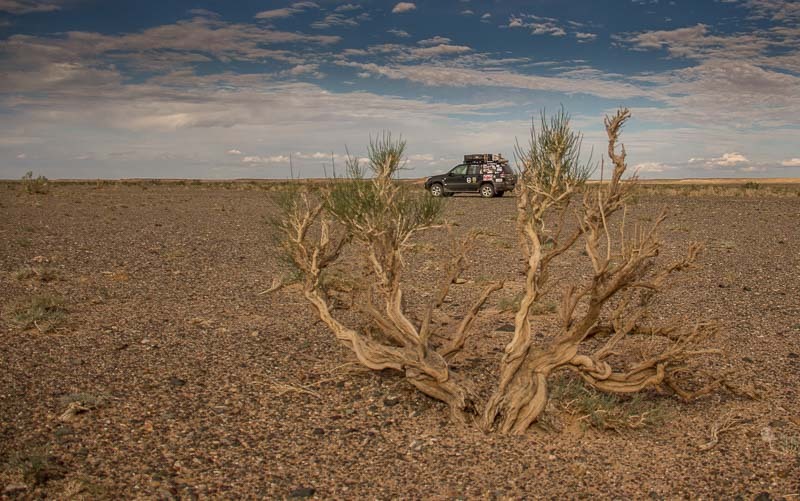 We needed to get to Altai, as there were no other hotel options in any other towns we came across and we didn’t want to camp since it was windy and cold. Driving in the dark, the road got so bad at some points that we lost the 20 liter water canister that we had on our roof-rack. I only realized it when we stopped later at the hotel in Altai. Just before Altai, the perfect, brand new paved road started and I was so happy that I wanted to kiss the road surface. 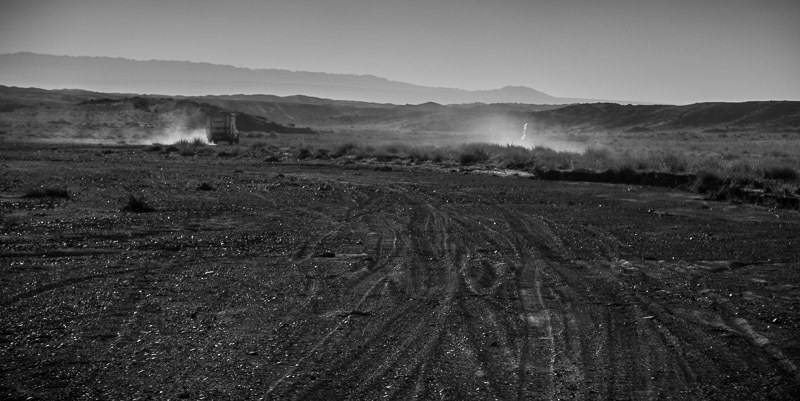 As much as I love off-roading and can’t get enough of dirt tracks to drive, we needed to make progress. My joy didn’t last too long as the issue with the transmission became ever more apparent. The automatic transmission didn’t shift into overdrive (5th gear) and sometimes not even into 4th. A couple of times it helped when we stopped, switched the engine off and restarted it. The transmission worked fine again, but a few miles later the issue became permanent and there was nothing I could do to make it shift into overdrive.It seemed to be an electronic problem, but since I assumed it was something complicated, my worries with the state of the vehicle continued, right after solving the previous issue. 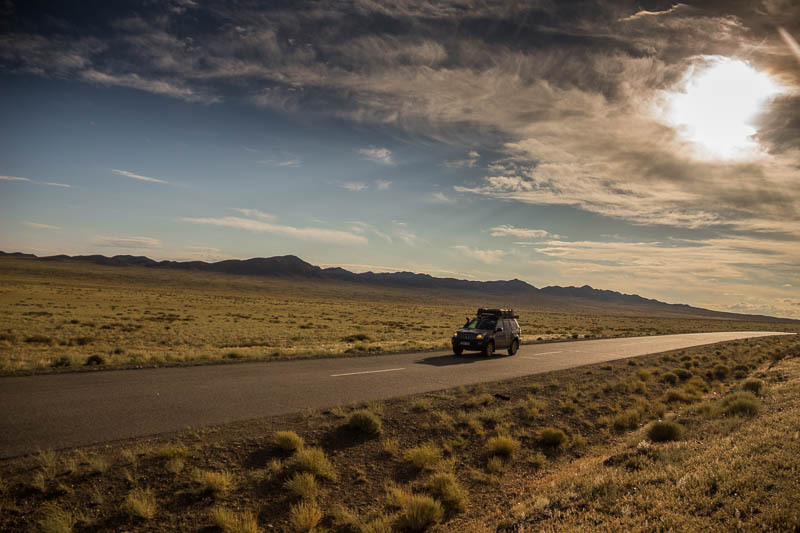 The next day we had a long but smooth drive all the way to Bulgan, the border town in the south western part of the country. 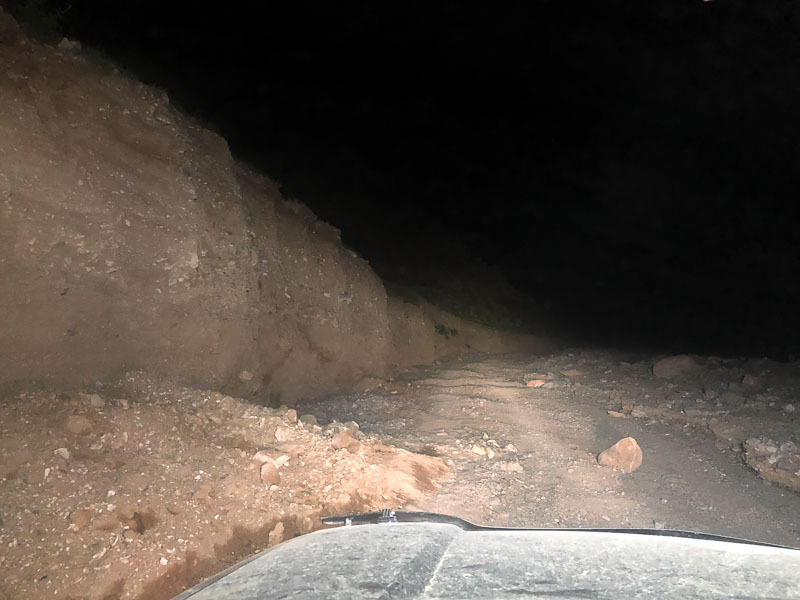 Due to lots of mining activities in the region, the road was perfect. 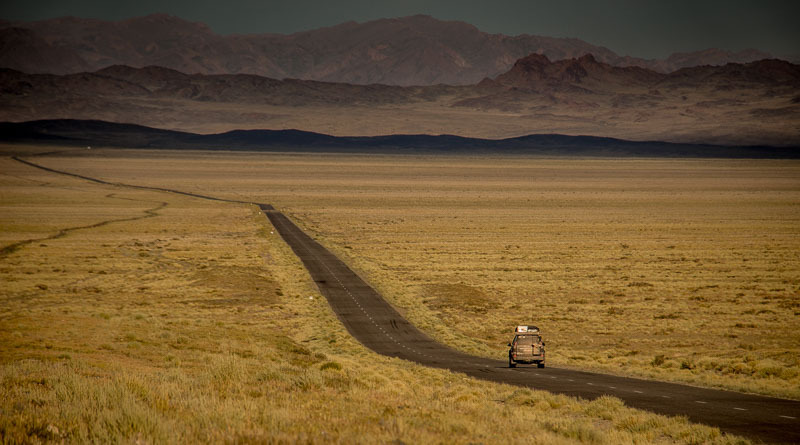 It appears that Mongolia builds great, smooth roads for the mining industry but not for its people. Driving in 4th gear all the way, I wasn’t sure if we’d lose even more gears. 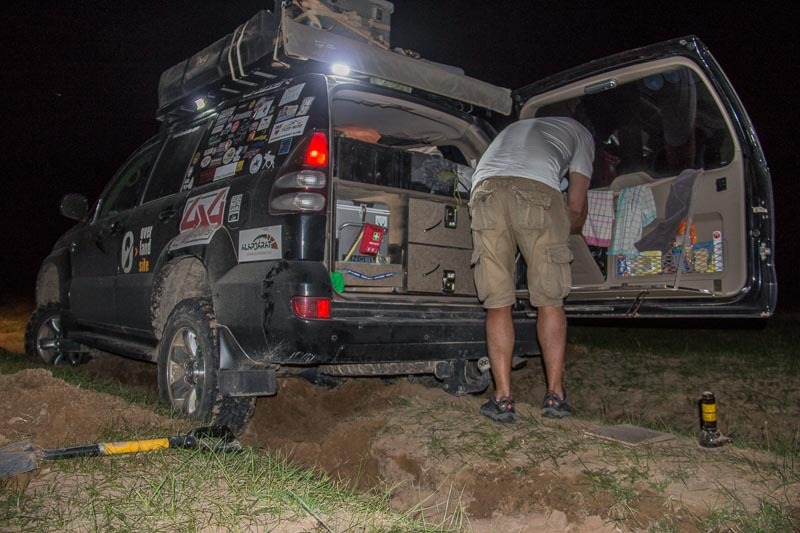 Resolving this issue in Mongolia looked impossible (without driving all the way back to Ulaanbaatar) so I was hoping to get it fixed as soon as we entered China a few days later. Bulgan is quite a depressing town. 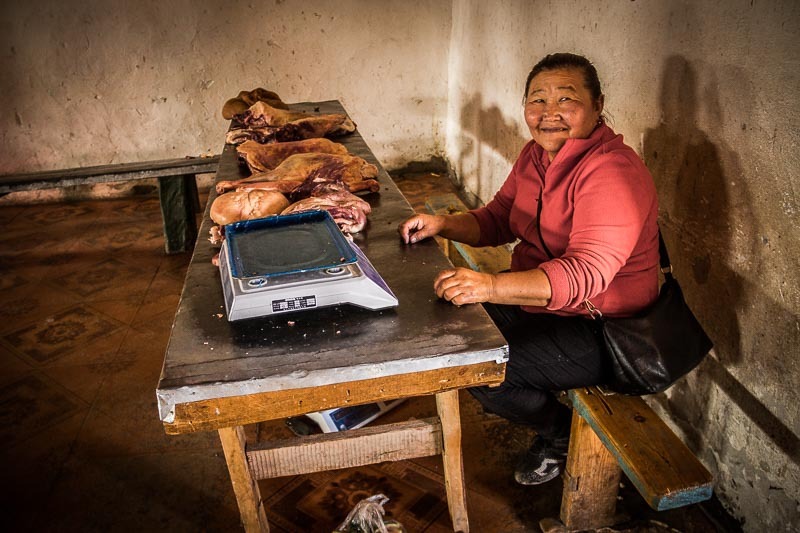 It was very interesting for us to walk around and take photos of local people, but it must be very tough for them to live there.It was great to meet Giampiero, Lotte and Niels again in Bulgan, one day before our crossing into China. 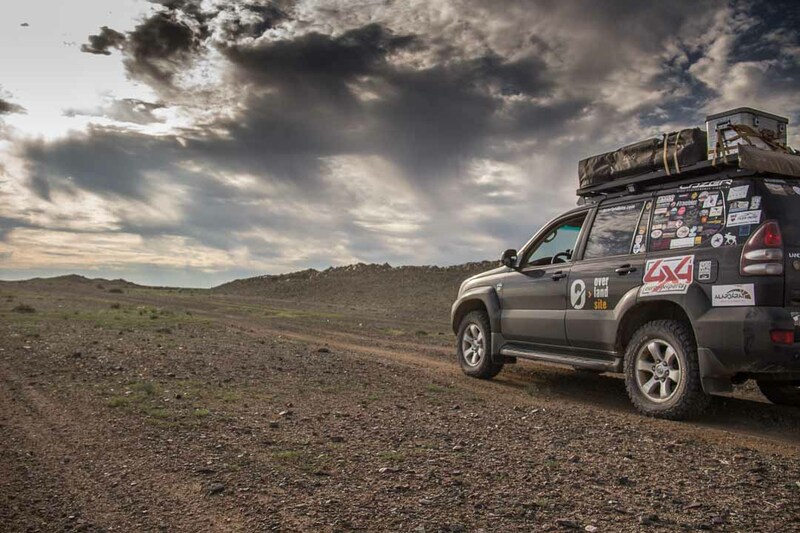 They’d also had an eventful week crossing the Gobi, getting stuck multiple times and not finding each other for hours. 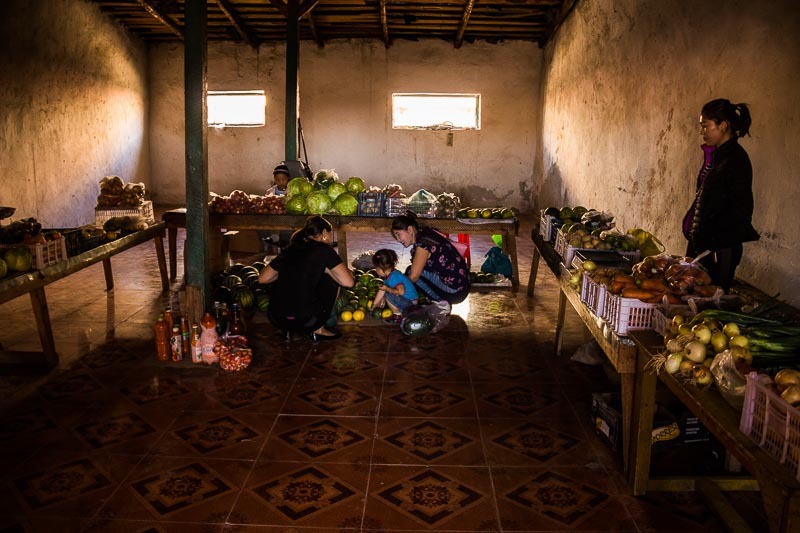 After a bit of grocery shopping at the local market we set off to find a camping spot close to the border. Everyone was excited about the next day. 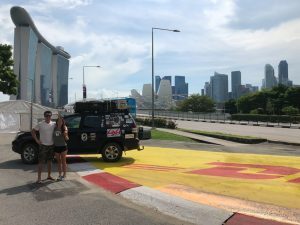 The 40 day adventure overlanding through China was about to begin! We had to wait until Monday (the next day) to cross, as the border isn’t open on weekends. 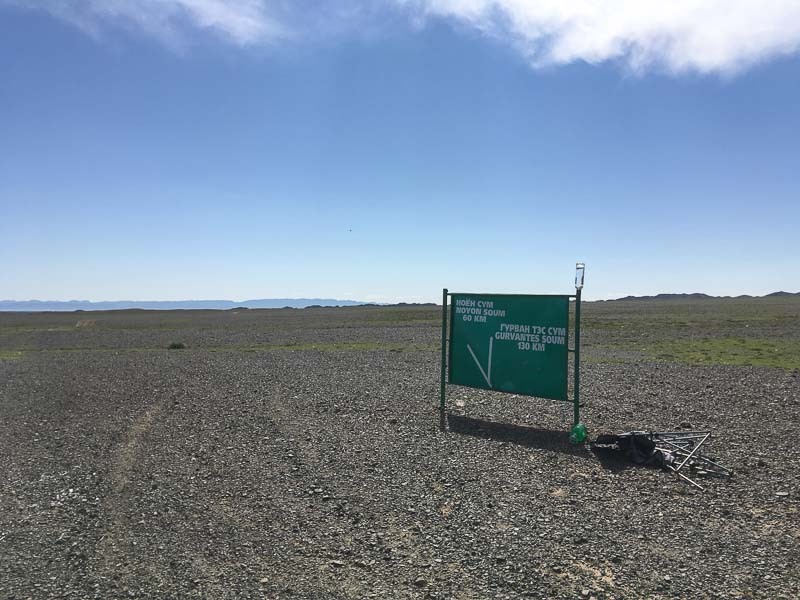 A major border crossing, where Mongolia is transporting coal, therefore making the country money, yet they don’t keep the border post open on weekends? 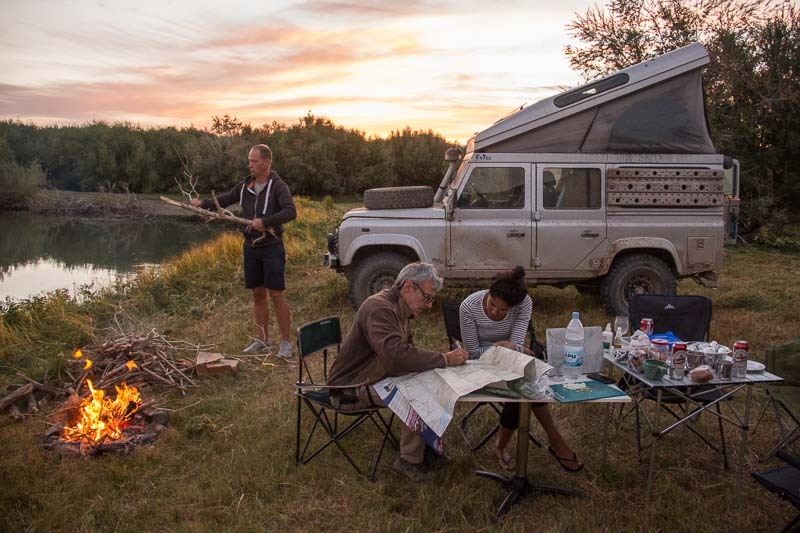 It didn’t matter for us though, as we found an awesome camping spot and spent a great night planning and talking about our itinerary through China!